It shouldn’t be that much of a surprise that an industry that has spurred countless movies to be made about it is actually worth $100B in the US alone. Yes, the market potential of the wedding industry is massive! Despite the sizable market, the wedding planning process is notoriously painful and stressful, causing unwanted tension between the to-be partners. Thankfully, Zola helps couples keep their sanity by providing an online platform for all aspects of wedding planning. 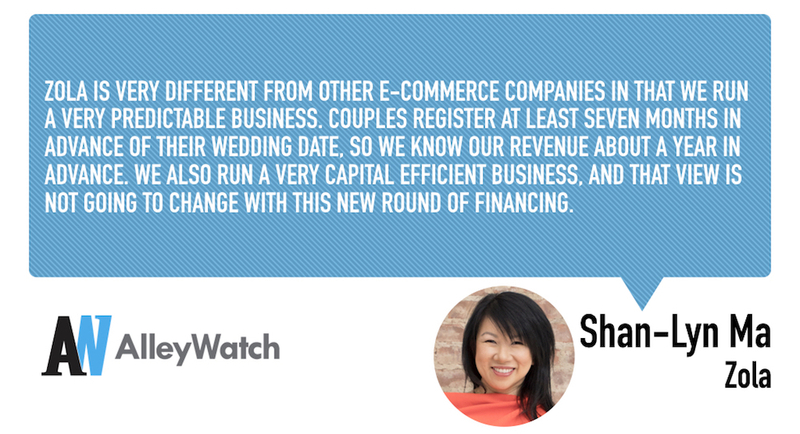 A modern-day wedding company, the startup offers an array of highly customizable tools such as guest-list managers, turn key wedding websites, and all-in-one registries, centralizing the logistics so couples can enjoy the happiest day of their lives. 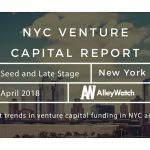 AlleyWatch spoke with CEO and Cofounder Shan-Lyn Ma to learn about the company’s exciting trajectory, future plans, and latest round of funding, which brings the total funding raised to $140.8M over five funding rounds for the startup founded in 2013. Our Series D round of financing totaling $100M was led by Comcast Ventures with participation from NBCUniversal, Goldman Sachs, as well as several other existing and new investors. Zola is the fastest growing wedding company in the country. We’re reinventing the wedding planning and registry experience for millennial couples getting married today. The tools that we offer include beautiful wedding websites, a customized checklist, an easy-to-use guest-list manager, and of course the premier all-in-one registry. What inspired you to start a wedding company? 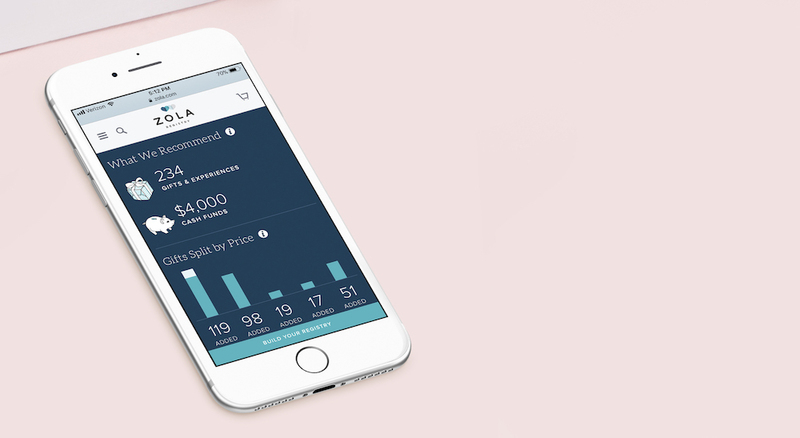 We built Zola because there was a real need for it. 2013 was the year that many of my friends were getting married and I was buying a lot of wedding gifts. I’m sure many people can relate to that year. Most of my friends were registered at the traditional department stores which felt very impersonal. My cofounder and I knew that we were well positioned to take on this problem because we both had extensive experience working in product development and design for e-commerce companies. We entered the market with registry, but our vision has always been to provide couples with all the tools that they need from the day they get engaged through their first year of marriage and beyond. How is Zola different than other wedding companies? In terms of our business model, we are the only wedding company that monetizes via the sale of registry gifts. In terms of our merchandise, we are so much more than a department store. On Zola, couples can register for home upgrades like copper cookware, experiences like travel gift cards, and cash funds for a dream honeymoon, all in one place. We also have many benefits such as our best-in-class apps, our ship-it-to-me-later feature, digital exchange, the list goes on. Zola is the only place where couples can plan their entire wedding in one place. Many people don’t realize how large the wedding industry is, it is a $100 Billion market just in the U.S. alone. Our revenue comes from our store of over 60,000 products. We work directly with over 600 brands – every brand from KitchenAid to Le Creuset to Airbnb. Our business model is an ecommerce business model. What are your go to registry tips? Register for what you want. This is your day and it’s your home that you are building. Also, make sure to add enough gifts at various price points so your guests feel like they have a lot of options to choose from. Couples often ask me what the most popular gifts are – I tell them guests love to gift kitchen appliances, wine glasses and things for the dinner table, so many sure you have enough of all those things on your registry for your guests to choose from! 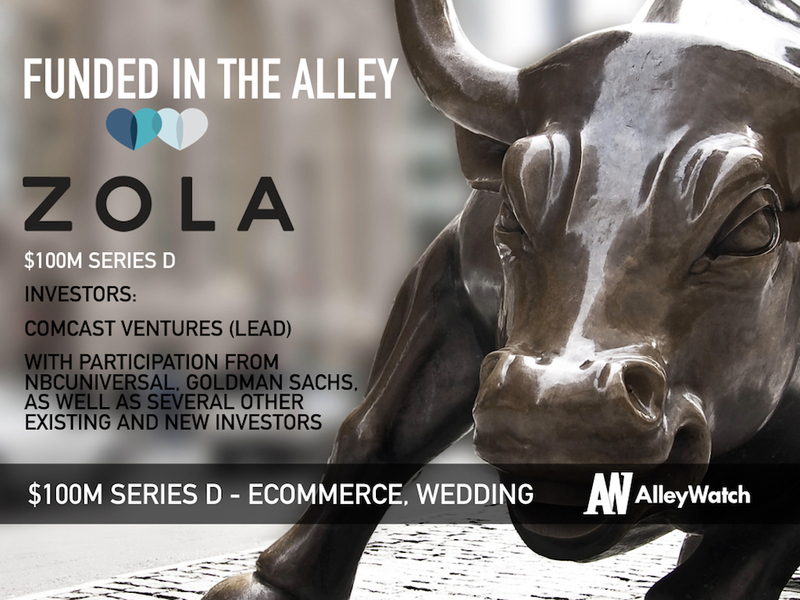 Raising capital is never easy, but Zola is a fast-growing business with huge profit potential. 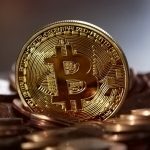 We are fortunate to have great investors. Zola is very different from other e-commerce companies in that we run a very predictable business. Couples register at least seven months in advance of their wedding date, so we know our revenue about a year in advance. We also run a very capital efficient business, and that view is not going to change with this new round of financing. This financing is going to help us accelerate on this path to be the go-to wedding company for all millennial couples. We will invest it in product development and innovation of our existing tools, as well as our larger vision of being a one-stop-shop for wedding planning. There is a lot to come from us later in the year. I really admire companies that do a lot with a little. A good example is Stitch Fix. Stick to your vision with or without a fresh injection of capital and operate as efficiently as you can. We are becoming the go-to place for the 2M couples who get married every year.